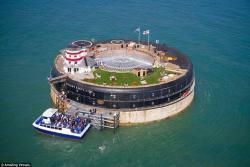 Manheim UK has held what it believes to be the first vehicle auction at sea – a unique offsite sale for Citroën on No Man’s Fort, a 150-year-old facility off the coast of the Isle of Wight near Portsmouth, England. Despite the logistical challenges of moving all of the specialist offsite auction equipment, along with Citroën’s guests and the Manheim team, from the mainland to a 150-year-old fort in the middle of the Solent, the sale was incredibly successful, with 100% of the 225 vehicles offered selling for 100% of their reserve prices. No Man’s Fort dates from the 1860s, when building work started on a number of military forts in the Solent to protect the UK from a potential French invasion. Having been decommissioned after World War Two, No Man’s Fort was bought by its current owners in 2012 and converted into a luxury hotel and function venue.